There are a lot of good trucking companies out there. But for some drivers, working for someone else just isn’t enough. The problem for some is that the lure of the open road tricks them into becoming owner operators before they are ready. “Making it” as an owner operator in trucking isn’t easy. You need to ask a lot of questions and listened to what other drivers said their mistakes were. Learning from others’ mistakes has can help you avoid some of the pitfalls they fell into. If you don’t have the cash or credit to go buy a truck on your own, you aren’t ready. Spend a few years as a company driver- at least two years- and get informed. 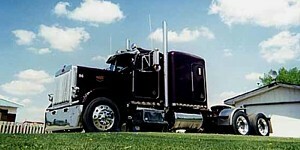 Check with trucking legal resources like OOIDA about the problems with lease purchase deals. Many drivers have lost a lot of years and gained a lot of ugly spots on their credit report because they didn’t investigate the drawbacks and consequences. The goal is to work smarter, not harder when it comes to being a successful owner operator. Cheap freight may get you 5,000 miles a week solo, but it also gets you a million mile truck long before it’s time. Choose your loads and the company you lease to carefully. You’re not a company driver anymore, so just because they promise you the miles doesn’t mean they’ll deliver the money. Remember, the more miles you run- the more fuel you will burn, the more maintenance you’ll require, the more wear and tear you’ll have on your truck and yourself. Some truckers seem to know everything. Unfortunately for them, ignorance is bliss. If you want to truly get ahead in trucking, always keep your eyes open for new opportunities. Don’t quit your contract on a whim, but always know what your options are. Network with other drivers and try to sift through the bolony to gain as much information as you can. You never know when things are going to go sour and you need to have a back up plan or two waiting in the wings. You may find that you aren’t doing nearly as well as you thought you were compared to other owner operators. Certainly there are other pitfalls out there. Just being aware that there are things to watch out for is a major step toward success in owner operator trucking.